At Glüpker, every sector and every individual requirement finds the matching welder. We produce frame structures, complicated chassis, sophisticated machine cladding and precise small parts according to customer-specific assignments. Our trained, DIN6700-2-certified welding staff guarantee professional execution of all welding orders. 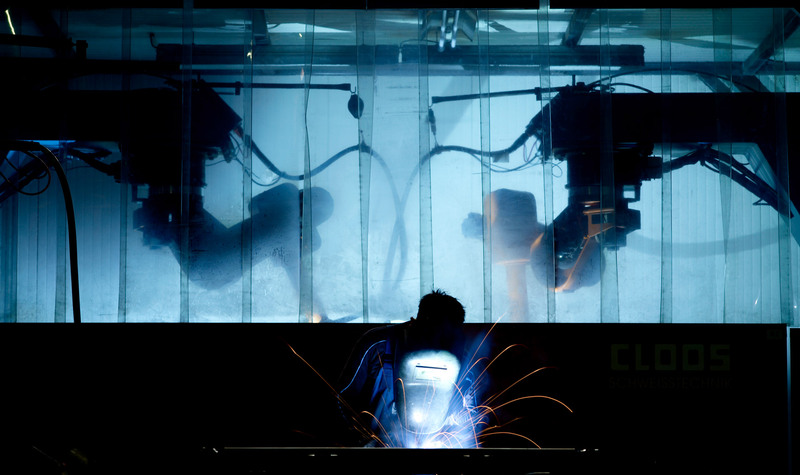 Our welding workspaces are fully-equipped to the highest standard with MAG/MIG pulse welding machines and WIG welding machines. We have welding equipment such as horizontal turning gear, vertical turning gear and longitudinal welding seam machines at our disposal. We also have additional welding equipment available in the form of point and stud welding machines for the fulfilment of specific assignments. Furthermore, flexible robot welding machines for the automation of welding processes are also part of our performance spectrum and technical equipment. As a complete solution for series manufacturing, automation reduces production costs and guarantees constant quality at a high rate of output. Furthermore, flexible robot welding machines for the automation of welding processes are also part of our performance spectrum and technical equipment.